HOME > RIPS‘ Eye > What is Japan’s Indian Ocean Strategy? What is Japan’s Indian Ocean Strategy? Japan has recently begun to play a more proactive and assertive role in the Indian Ocean region. In January 2019, for example, Japan sent its Foreign Minister, Taro Kono, and its Chief of Staff, Joint Staff, Katsutoshi Kawano, to the Raisina Dialogue, a high-profile conference in India devoted to geopolitics. Before that, in 2018, Japan participated in joint exercises conducted between the Ground, Maritime and Air Self-Defense Forces of Japan and India’s Army, Navy and Air Force. And since 2017, the Japanese helicopter aircraft carriers "Izumo" and "Kaga," which will be designated as aircraft carriers, have visited India and Sri Lanka every year. In addition, Japan has also donated patrol vessels to Sri Lanka. And currently, under the “Free and Open Indo-Pacific” initiatives, Japan is building many infrastructure projects in the coastal countries along the Indian Ocean. What explains Japan’s increasing engagement in the Indian Ocean region? In a word, the answer is China. 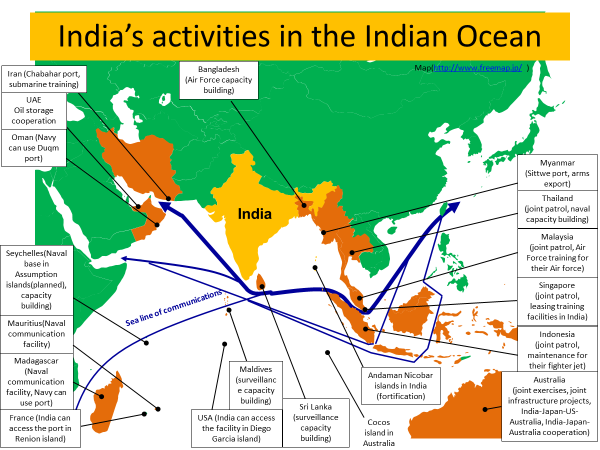 China first began projecting power in the Indian Ocean in the 2000s: ever since it initiated its anti-piracy mission off the coast of Somalia in 2008, Chinese naval vessels have maintained an ongoing presence in the Indian Ocean. 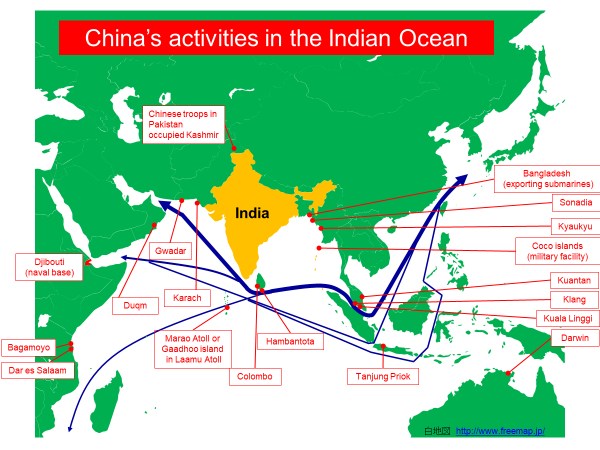 According to Sunni Lamba, the Chief of Staff of the Indian Navy, who also attended the Raisina Dialogue in January 2019, at any given time, there are six to eight Chinese Navy ships dispatched to the northern part of the Indian Ocean. [i] In addition, China has also been strengthening relations with other countries in the region by exporting submarines, exporting two to Bangladesh and eight to Pakistan. Furthermore, China increased the number of naval bases and ports which provide it access to the Indian Ocean: it has established a naval base in the East African country Djibouti, it has acquired a 99-year lease to the Sri Lankan port of Hambantota, and it has built a number of other ports in the region. There are legitimate concerns that these port facilities will become supply bases for the Chinese Navy (Figure 1). Because the security situation in the Indian Ocean has long been a high-priority national interest for Japan, China’s expanding presence in the region is a major concern. Japan has dispatched warships to the Indian Ocean since 2001 to safeguard Japanese sea lines of communication (SLOCs) in the Indian Ocean. Yet China’s recent naval expansion raises concerns that Japan’s SLOCs will be vulnerable to attack from Chinese submarines. China’s expansion also raises energy concerns, as the sea lanes that carry energy resources from the Middle East to Japan run through the Indian Ocean. But given its limited naval resources, how many vessels can Japan actually dispatch to the Indian Ocean? Because Japan’s Maritime Self Defense Force must protect the seas around Japan and the South China Sea, the number of warships that the Japan Maritime Self Defense Force can send to the Indian Ocean is limited. Thus, Japan must identify actionable means of countering China in the Indian Ocean that make effective use of its finite resources. What should Japan do? Here are three ideas. First of all, Japan should urge India to play a greater role in the Indian Ocean. If any countries in the Indian Ocean can develop large naval forces against China, the United States and India can. Yet even though the United States is the more powerful of those two countries, the Americans will be limited in what they will be able to commit to the Indian Ocean: because its national interests require it to deploy ships to other nearby areas, such as the East China Sea and the South China Sea -- both of which happen to be critically important for Japanese security -- more American ships in the Indian Ocean would mean fewer American ships in those other nearby regions. Thus, when it comes to the Indian Ocean, Japan has a natural ally in India, whose geography requires it to prioritize expanding its influence in the Indian Ocean as a national interest. In fact, India has already begun expanding its naval presence in the Indian Ocean (Figure 2), although its efforts have been hobbled by the Indian Navy’s aging equipment and its inadequate anti-submarine capability. This presents an opportunity for Japan, as Japan could strengthen its ties with India by assisting India with the improvement of its anti-submarine capability. The second course of action is for Japan to serve as a mediator between countries that are wary of India and the United States’ expansion in the region. Countries in the region have good reason to be concerned about India’s current trajectory and growth. After all, India is a hegemon in South Asia: it accounts for approximately 70% of South Asia’s total land area, and it consumes about 80% of the total defense expenditures of all the South Asian countries combined. India’s relations with neighboring countries can be very complicated. In fact, recent history even indicates that such reservations are not entirely unfounded. Just to name one example, Sri Lankan attitudes towards India have been negatively affected by India’s peacekeeping mission in Sri Lanka. During the mission, which lasted from 1987 to 1990, the Indian army fought with Tamil militant groups, in what has been called by some the Indian version Vietnam War. Therefore, because Sri Lanka and other countries in the region may be concerned about the consequences of India having too much influence, it is incumbent on Japan to ease tensions between India and those countries, and to encourage them all to cooperate in order to counter together the challenges posed by China. If Sri Lanka chooses to strengthen its relationship with the United States rather than India, Japan may still benefit. Indeed, there is already some evidence that that is how events will play out: for example, in 2018, Sri Lanka joined the Rim of the Pacific Exercises (RIMPAC). [ii] But there are also obstacles to greater cooperation between the US and Sri Lanka. The US has accused the current Sri Lankan government of committing war crimes during the Sri Lankan Civil War, which concluded in 2009. As a result, the government of Sri Lanka has been cautious about strengthening ties with the United States. And of course, reflecting the distance between Sri Lanka and both the United States and India, there is the fact that Sri Lanka has been largely receptive to China’s efforts to expand its influence to Sri Lanka. Sri Lanka has chosen to cooperate with China in large part because cooperating with either the United States or India is so undesirable. Japan, however, is in a very different position than either India or the United States. It should therefore present itself to Sri Lanka as an alternative to the US, India and China. At the same time, however, Japan should also cooperate with India and the United States, in order to promote the common interests of all countries in the region. The third course of action is for Japan to become a provider of technology that China, India and the US cannot or do not want to supply to countries in the Indian Ocean region. Regions where Japan has provided technical assistance, such as Northeast Asia and Southeast Asia have become enviable examples of successful economic development. The undeniable success of Japan's technical assistance makes Japan’s technological capabilities clear and distinguishes Japan as a world-class innovator. Therefore, Japan should not only export hardware, such as defense equipment and infrastructure, but also provide training and education that will further enhance Japan’s prestige and create closer relations between Japan and other countries in the region. In conclusion, there are three courses of action that Japan should take to advance its interests in the Indian Ocean: it should support India as security provider; it should become an intermediary between India, the US, and other local countries; and it should be a generous supplier of technologies. Together, these three courses of action should be considered pillars of Japan’s Indian Ocean strategy. [i] Press Trust of India. “’Chinese Navy Is A Force That Is Here To Stay,’ Says Navy Chief.” NDTV.com, January 10, 2019. Accessed January 17, 2019. https://www.ndtv.com/india-news/navy-chief-admiral-sunil-lanba-says-chinese-navy-is-a-force-that-is-here-to-stay-1975415. [ii] “A team of SLN Marines joins Exercise RIMPAC – 2018.” Sri Lanka Navy News, June 4, 2018. Accessed January 17, 2019. http://news.navy.lk/eventnews/2018/06/04/201806041610/.